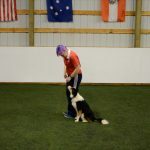 Tag Archives for " Mastering jumping skills "
A few days ago I posted with an update of Chispa's progress on Module 1 of Linda Mecklenburg's Mastering Jumping Skills: Foundation Flatwork. As the videos get approved by Linda for inclusion into each Module, they'll also appear there. But, while I'm waiting for that, I'll continue to include her progress in this blog. Below is our progress on Module 2. If you're not seeing anything more in this post, it's because you're either not a premium subscriber, or you are, but you aren't logged in, OR, you haven't been a subscriber LONG enough to see this content quite yet. Become a premium member to get access to handouts, videos, and a discussion forum for this blog series! Chispa's training continues, and it is FUN. I haven't been posting very often here, because there hasn't really been anything new going on EXCEPT for working through Linda Mecklenburg's Mastering Jumping Skills: Foundation Flatwork material. Right now, Chispa and I are working through Module 1. The videos below are all of the videos you'll see in Module 1, although only the first video has received Linda's OK to be included in the official material. The collection recall has been reviewed by Linda; the rest have yet to be reviewed. We're also continuing our running contact training, and Chispa is now on a full height dogwalk. She's not completely confident on it yet so we're just doing the down ramp for now, taking it easy. I switched from my lower wood dogwalk to the full height aluminum dogwalk, mostly because I was tired of hauling the wood dogwalk around on PVC legs. The aluminum dogwalk is a couple feet higher from where we were, and, because each plank is hinged in the middle, it's noisy and a bit bouncy. So, until Chispa is ok with those things, I won't be asking for much speed, just understanding and confidence. 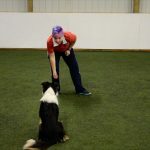 I continue to be amused and proud that my own methods using the Treat and Train have been adopted by Europeans and are spreading; it's nice to see people actually training their dogs instead of just throwing toys. Admittedly, it seemed to work for some, but I think the vast majority of dogs will learn better when the differential reinforcement is greater, and when they're thinking about what they're doing, for the food, rather than a thrown toy. In any case, here are the videos!